This is really only half a vintagebookcook trial. I had some wild rabbit defrosted and needed something to do with it. I had a pie recipe inspired by Arbutus, but that was the kind of pie that is “casserole with mash on top”, and I think you can guess how I feel about that. 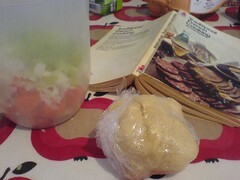 Jennie Reekie’s book has a few rabbit recipes, but they all call for “a rabbit”, and I had 300g diced. The weight of rabbits given were around the 1.25kg mark (bones included?) – so I decided to try lapin au cidre another day. But what I would do is try the the basic bunny pie mix, but put it in some proper actual pastry, so today I tried out Jennie’s recipe for paté brisée. You’d think I’d have had enough of paté, huh? Groan. Another from Jennie Reekie’s Traditional French Cooking. First, a warning. Whilst making paté is a fun undertaking, be warned. I would only recommend making this if you have people easily available to help eat your paté. If you are a single girl, practically in study-related hibernation and live with a vegetarian, you will be eating paté forever. I don’t have a photo of this paté because after eating paté sandwiches for AN ENTIRE MONTH, I was too traumatised to even consider it. My friend K gave me a selection of Heals patés and biscuits for christmas, and I haven’t been able to open them! I am suffering extreme paté overload. On saying that, the fact that the paté lasted a month, and I was still quite content to have paté sandwiches for lunch until they ran out is a testament to this slightly odd, but very simple recipe. Don’t be put off by the calls for sauce béchamel (in English, “bechamel sauce” – no, no need to congratulate me) – it sounds wierd, but it’s just what this paté needs to be nice, soft and spreadable. Alix and I found “Traditional French Cooking” (1975) in Amsterdam’s Waterlooplein market on a trip to Holland earlier this December. I love the title juxatposed with the author’s name. “Jennie Reekie”! If any name could be less traditionally French! I feel a little naughty starting with such a basic recipe, but you know what? Sometimes you just need a design classic! Comment from Jennie: “this makes a very good lunchtime snack”. Any time, Jennie.